NAGASAKI, Japan (AP) — Struggling a bit with a left arm that has never straightened out, Sumiteru Taniguchi slowly peeled the undershirt off his frail 86-year-old body to show two visitors his scars from the atomic bomb attack on Nagasaki. 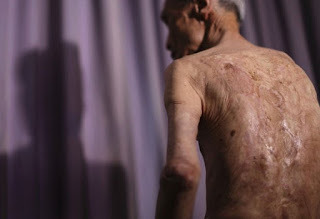 For 70 years, he has lived with them, a web of wounds covering most of his back, and the remains of three ribs that half rotted away and permanently press against his lungs, making it hard to breathe. His wife still applies a moisturizing cream every morning to reduce irritation from the scars. Not a day goes by without pain. He was 16 and on the job as a letter carrier when the powerful blast threw him from his bicycle. He had been about 1.8 kilometers (1.1 miles) from the epicenter of the "Fat Man" plutonium bomb that detonated over Nagasaki on Aug. 9, 1945, killing more than 70,000 people. Six days later, Japan surrendered, ending World War II. Speaking in a weak voice with some effort, he told the story last month of wandering for three days in a daze, unaware of the seriousness of his injuries. He felt something like a ragged cloth hanging from his back, shoulder and arm: It was his skin. He would spend the next 21 months lying on his stomach, getting treatment for his burned back, decomposing flesh and exposed bones. Going in and out of consciousness, he could hear the nurses passing by in the hallway asking each other if the boy was still breathing. He thought: "Just kill me." Because he lay immobile for so long, as one of his teenage arm bones grew, it blocked the joint at the elbow so he can't fully extend the arm. Taniguchi hopes no one else will have to suffer the pain of nuclear weapons. He heads a Nagasaki survivors group working against nuclear proliferation, though old age and pneumonia are making it harder for him to play an active role. After so many years, his words are tinged with frustration. "I want this to be the end," he said, slipping his shirt back on. This story has been corrected to show that Taniguchi was injured in the atomic bomb attack on Nagasaki, not Hiroshima.